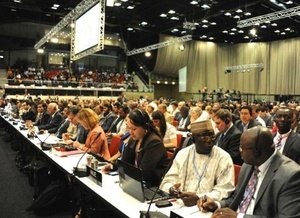 DURBAN, South Africa – The wee hours of next Friday morning will mark the finish line for the UN climate negotiations in Durban. This Monday morning, the home stretch came into view as the world’s major players – and biggest polluters – each added some showmanship to their stride. Bellona’s Paal Frisvold and Magnus Borgen wrote the following comments on events as the manic Monday drew to a close. Bellona spent the day getting a bead on the various negotiating positions as forwarded by Durban’s big players – the European Union at 10:00 am, the United States at 4:00 pm, and China at 6:30 pm. We have all been nurturing the assumption that over 190 countries could come to an agreement on a framework for a new climate deal. But the reality is running its own course. This is why Monday’s developments were especially deserving of close attention – at this point, it is about the world’s largest economies and regions, and the hopes tied to their finding common ground. Their statements and moves are of the kind one wants to observe and document. EU Climate Commissioner Connie Hedegaard was refreshingly clear at her press conference this morning, though perhaps a bit overly ambitious, given the circumstances. The EU wants to extend the Kyoto Protocol, and is working hard at these negotiations to makes sure the parties agree on a concrete roadmap to reach a new climate agreement in 2015. The EU’s objective is to have such a roadmap ready for a new legally binding agreement to take effect in 2020. “We do not need more time to think. Now it’s time to act,” said an optimistic Hedegaard to an audience gathered in the Durban venue’s largest conference room prior to a closed-door bilateral meeting between the EU and China later in the day. U.S. chief negotiator Todd Stern spoke of last year’s agreement in Cancun, where all countries agreed to carry out the greenhouse cuts that they saw themselves capable of committing to. That agreement, however, carried no demands beyond what individual countries were willing to post as their own emissions cuts targets, hence the unpredictable framework offers too much simplicity and wiggle room – all while the world is facing its greatest challenge yet. “In order for there to be a legally-binding agreement that makes sense, all the major players are going to have to be in with obligations and commitments that have the same legal force,” Stern said, according to Reuters. Stern promised those gathered that he would personally ask about what exactly the Chinese had in mind. For his part, Xie Zhenhua, China’s chief climate negotiator, continued with China’s charm offensive. During a conference with NGOs, Xie took the opportunity to expound on China’s twelfth five-year plan. Whether or not China, in two hundred years’ time, is said to have been culpable for this climate crisis, the Chinese themselves must undoubtedly be involved when solutions to climate challenges are discussed. Several million Chinese already feel the effects of climate change on their skin, and it is worth noting that the country has initiated large-scale adaptation measures. Furthermore, a national emissions trading system is already being tested in seven provinces and several cities. Bellona staff in Durban have observed interesting cultural and political differences between the various major powers at their briefings. Where the EU’s Hedegaard and America’s Stern took time to answer a series of questions from the press, China chose the tack of not answering a single one. Tuesday will see the parties meet again for further talks – then each retreats back into their corner. The level of the home stretch excitement is definitely rising here in Durban. The stop watch to Friday will tick by in the blink of an eye, but it would be overstating things to say that the chief negotiators from the US and China are about to engage in more fast-paced exchanges now that they have positioned themselves for the final kick sprint. The finish line will inevitably have to be crossed in the end – sadly, this time, there may not be any winners, nor fanfare, nor a medal ceremony to award the world community with a newly reached global climate deal.